BUCCABURY LIGHT RAILWAY, The Model. The layout is modelled (as accurately as we could) on the station in the late 50's / early 60's. By that time all the original locomotives had been replaced but we have ensured that they are represented, along with a host of other typical light railway equipment which is included for variety and interest. Many of these 'stage extras' are in the 'house colours' of their respective owners rather than in the somewhat drab BLR green livery. Some compromise has been made to allow the representation to fit into a modular layout; generally this takes the form of dimensional compression and curve tightening. There is mention of some cattle traffic but we have had to take a 'best guess' as to the site of the facilities as no evidence now remains. 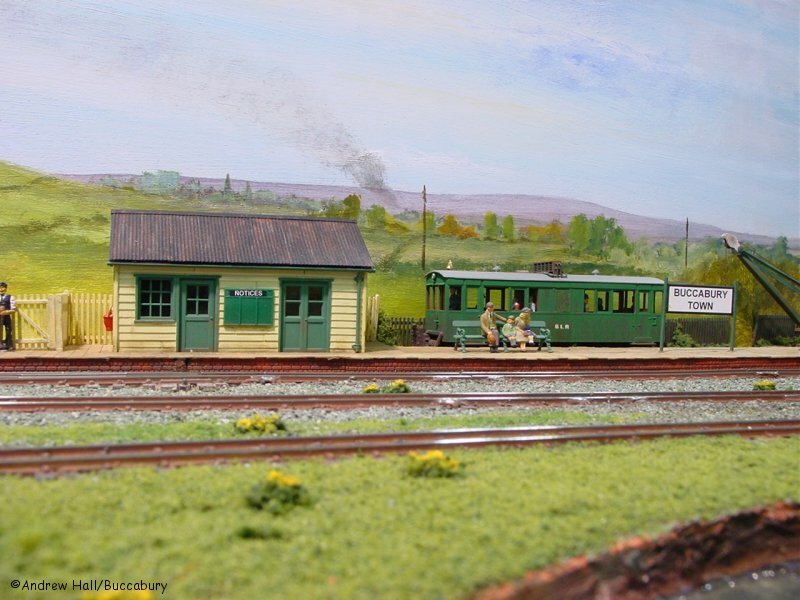 To represent the traffic we have used Welshpool & Llanfair Light Railway vehicles. The Welsh Highland Railway 'Eisteddfod' coach is a fairly close match for the original BLR coaches (which had only two end windows) and for variety we have supplemented them with an Ashover coach. War Department 'D' type bogie wagons and standard 'V' tippers are, thankfully, easy to find in 4mm! 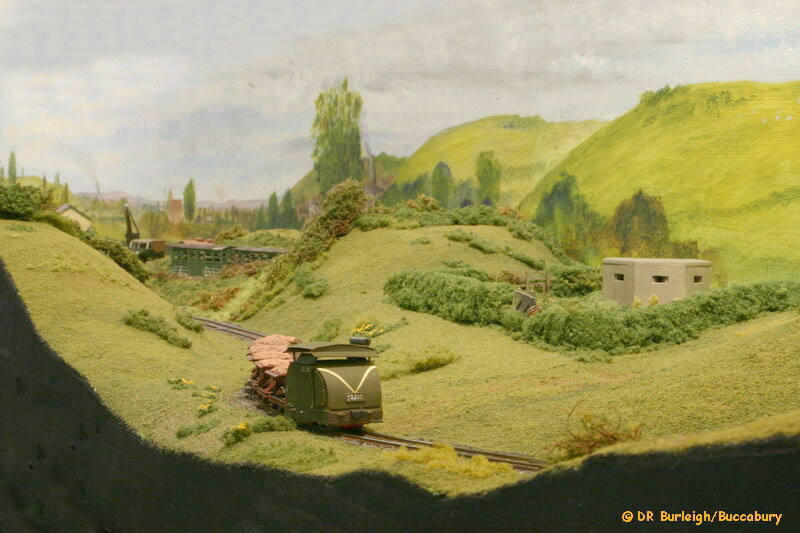 We have used other rolling stock to add some variety although the one BLR van to be seen is a reasonably accurate representation of the vehicle used for the produce of Twyford Mill. The 'resident' locomotive stud has been chosen as fairly representative of a light railway although a number of extra machines are used for interest. We have now acquired a couple of Baldwins and a couple of protected Simplexes, which run with an older armoured Simplex. The first section finished is Buccabury Town station, and 'Clay Pit' junction. Correctly, the fiddle yard should be at the rear along the 'main line', although it can be fitted to the right-hand side, along the 'clay pit' line. 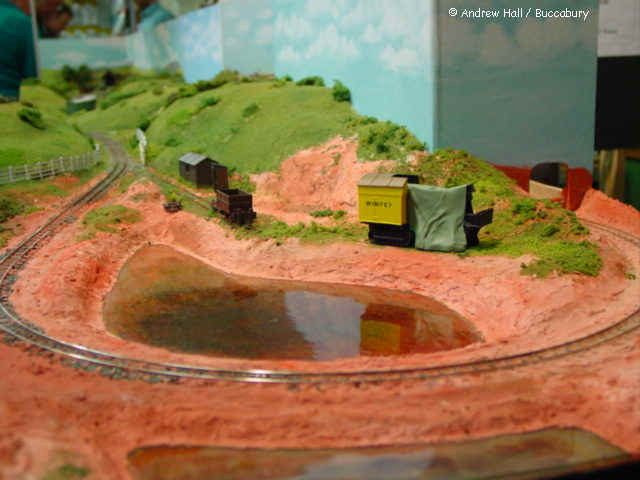 The second section is the 'clay pit' board which shows only a small section of the clay pit, a real clay pit could be larger than the whole model, the trains drop down, over a flooded section of pit to a lower level, in real life the line only turned through a maximum of 90 degrees, rather than doubling back on itself, as in the model. 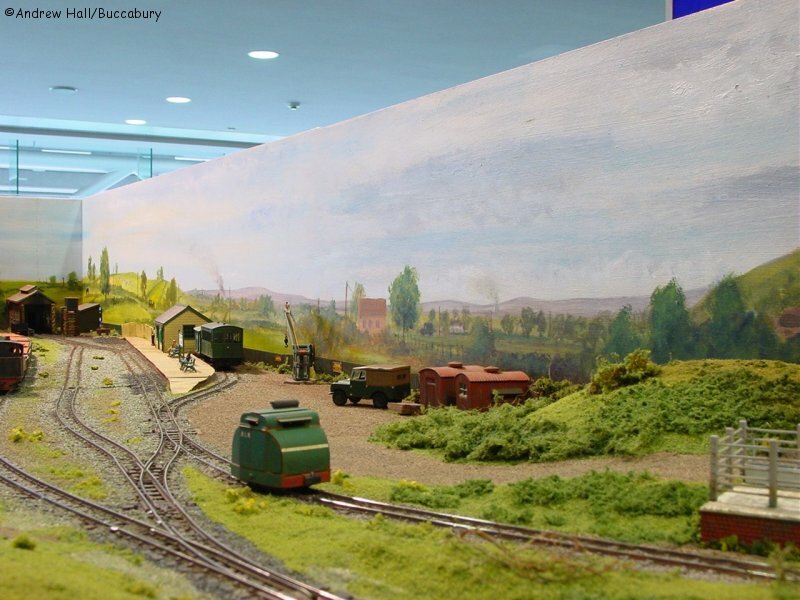 The Peco back scene papers have been replaced with a tailor made painted back scene by group member David Gale. We are in the process of building a corner of the Brickworks itself. Each board is 3' (915mm) long by 1'3" (380mm) deep. 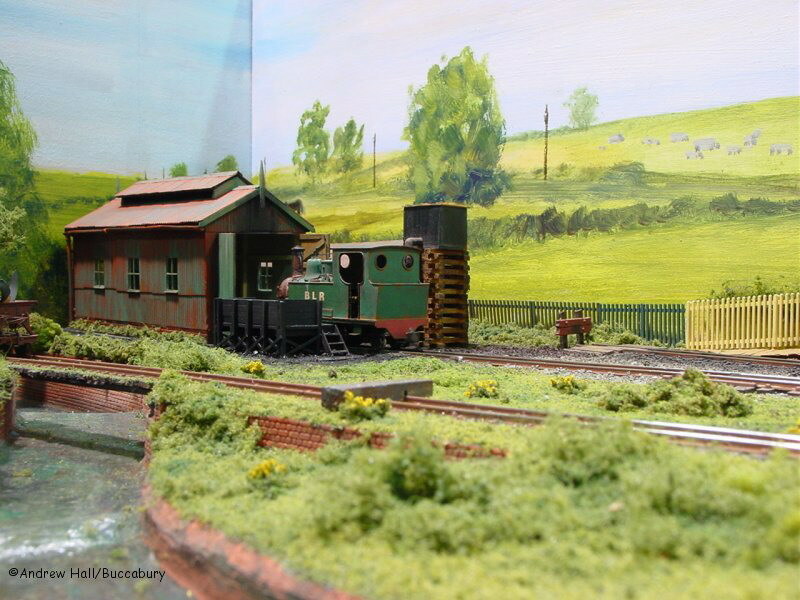 Contains Loco facilities Shed, Coal Stage and Water tank & The Station Building, with a short bay and run around loop. The "Brickworks line" crosses a stream in front. Contains Station Yard and Cattle Dock, the line leaves the station, joins the "Brickworks Line" and then passes into a cutting. A short cutting passing under a Bridge, leading into the Hidden sidings. The line meanders between short cuttings, with a junction turn out, with track leading to the rear & the right. Allowing boards to be added in a straight line, or on the rear, or both. The line passes out of a cutting, through a gate and down into the claypit, crossing an old flooded worked out section. BL Brickworks Left Now have the Trackwork laid and are awaiting scenery & buildings. BR Brickworks Right Now have the Trackwork laid and are awaiting scenery & buildings. This board includes the approach to the Brickworks. The layout can appear in various guises. 1) The smallest is 9' (2743mm) long by 1'3" (380mm) deep. This is the two station boards and the fiddleyard only. 2) The "L" shape is 9' (2743mm) long by 4'3" (1295mm) deep. This is the Station boards, the junction board and the fiddleyard. 2a) The straight variation of 2 above is 12' (3657mm) long by 1'3" (380mm) deep. This is the Station boards, the junction board and the fiddleyard, in a straight line. 3) The third version 12' (3657mm) long by 4'3" (1295mm) deep. This is the same as 2 above with the addition of the clay pit board on the right-hand end (as seen from the front). When the new Brickworks is finished there will be four more versions. 4) The first new version will be 15' (4572mm) long by 1'3" (380mm) deep. This is the same as 1 above with the addition of part of the Brickworks on the left-hand end (as seen from the front). 5) The second new version will be 15' (4572mm) long by 4'3" (1295mm) deep. This is the same as 2 above with the addition of part of the Brickworks on the left-hand end (as seen from the front). 5a) A variation on version 5 will be 18' (5487mm) long by 1'3" (380mm) deep. This is the same as 2a above with the addition of part of the Brickworks on the left-hand end (as seen from the front). 6) The Full version will be 18' (5487mm) long by 4'3" (1295mm) deep. This is the same as 3 above with the addition of part of the Brickworks on the left-hand end (as seen from the front). The layout is freestanding with its own lighting. We will require one 13amp socket, for power & lights, one table & a couple of chairs. The Insurance Value is £1,200 with no individual item above £200. When the fiddleyard is on the back we require a depth of 6' (1829mm), to allow us to pass around the back of the fiddleyard. 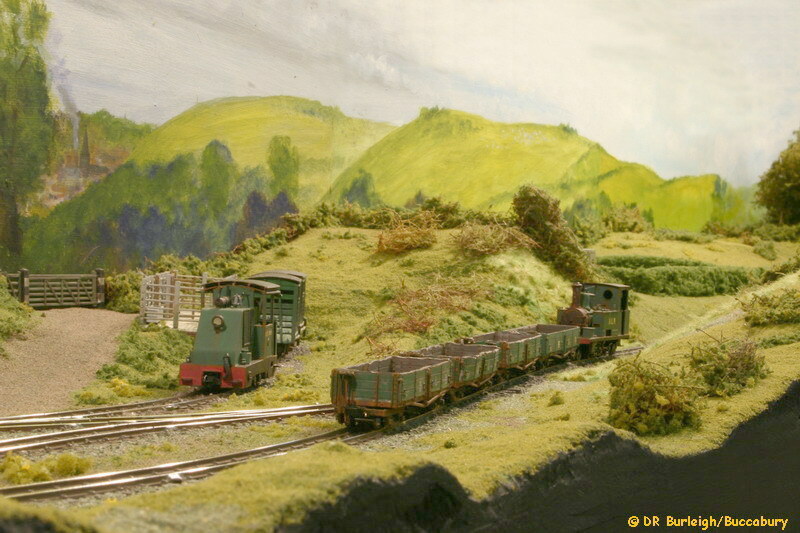 The current Standard version is No3 Station to Claypit, with Fiddleyard at the rear. Versions 4 to 6 would need a five to six operators (Three operators & two to three spares).